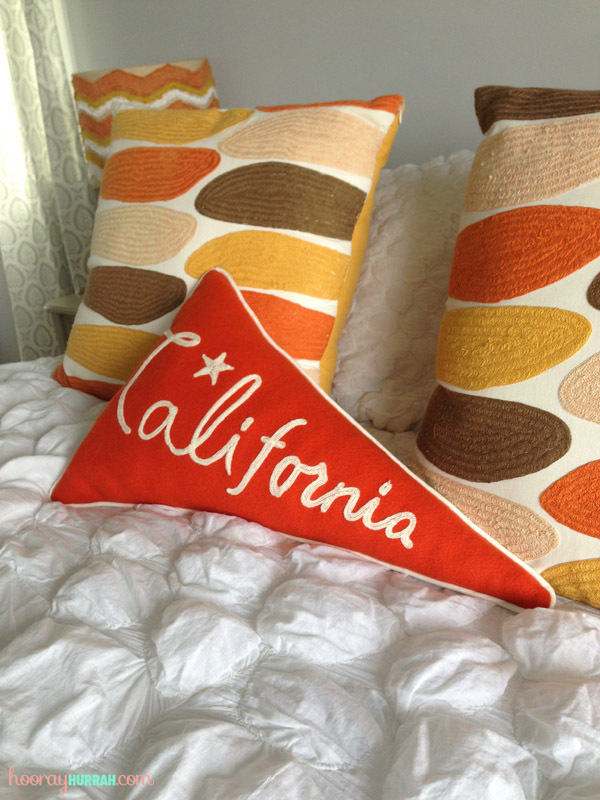 Somebody went to Portland, Oregon and all she got was this… California pillow? When I’m traveling I always try to shop for pieces that I can’t just pick up in L.A., and believe it or not this purchase from my recent trip to Portland fits the bill. OK, so I’ll admit to a hint of irony here, but this fun bit of Golden State regalia was in fact crafted in Portland itself for the Stumptown-based Schoolhouse Electric & Supply Co.
Schoolhouse Electric is one of my very favorite décor sites to browse online, so getting to shop their goods in person was quite the treat! 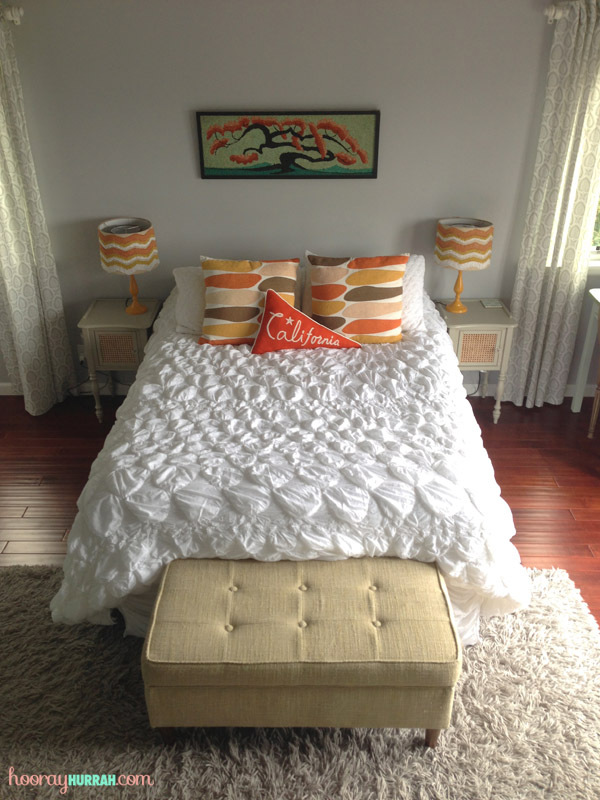 Not only does the pennant pillow look just right among the other pops of orange in our bedroom, but it’s a design-driven way to display my pride for the state where I was born and raised and currently spend my days. There are Portland, NYC, and “Home” versions too. How cute! Hello there! My name is Ilana Saul and Hooray Hurrah is my lifestyle blog. Hooray Hurrah is a place for the things that inspire me from fashion to weddings to decor and much, much more. 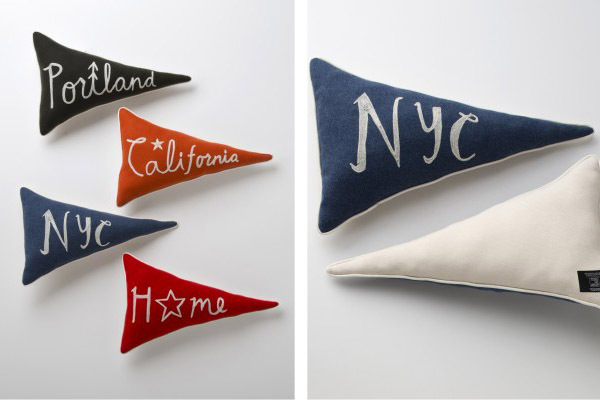 This entry was posted in Decor + DIY, Nesting and tagged decor, design, flag, home, interiors, oregon, pennant, pillow, portland, schoolhouse electric, throw pillow. Bookmark the permalink. So perfect. Thanks for visiting us while you were in Portland and for the great post!